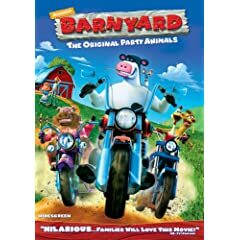 Barnyard is a new one out by Nickelodeon. Considering that we’re die-hard Nick Jr. fans here, I thought this one would be good for my son. He saw this movie in Target and calls it the “movie about the pig with poo on his face.” (Pictured is a pig with what is presumably mud on his face.) He’s asked for it several times since, so I had to get it.